America’s gaffe-prone granddad Joe Biden had a rare moment of intellectual clarity and honesty in 2014, when he said something about Saudi Arabia that would be blindingly obvious to anyone except perhaps Thomas Friedman and the New York Times editorial board. "Our biggest problem was our allies," he said in a talk at Harvard. The Saudis, Qataris, Turks, and Emiratis were so determined to topple a secular dictator in Assad that they poured millions in cash and weapons to Al Nusrah. This was probably the only recorded time that any major modern American figure broke with tradition to try publicly criticizing the medieval Gulf monarchies. Of course, Biden promptly apologized, thereby proving H.L. Mencken’s quote about dishonorable politicians. At least he didn’t break that tradition. With the alleged murder of dissident journalist and part-time Muslim Brotherhood member Jamal Khashoggi in the Saudi Consulate of Istanbul, the Western media seemed to have rediscovered this ancient truth, that Saudi Arabia is a source of all problems for the United States, and Washington really should cut the kingdom loose to survive or perish. There’s no direct established evidence of the killing, other than the claim by Turkish intelligence, who are not very trustworthy to the media. But it looks likely that Kashoggi was in fact murdered. 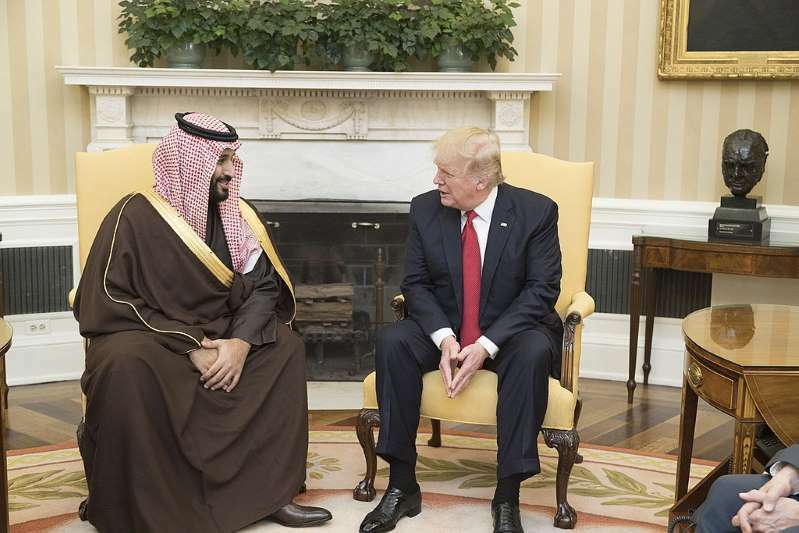 Saudi denials were prompt initially, although it came with a caveat that all security and surveillance footage of the day Khashoggi went missing has somehow disappeared. There are also recent rumors that Saudis are about to release a statement saying that Khashoggi was killed in a botched interrogation and abduction attempt, although that cannot explain why interrogators would bring a chainsaw to chop someone if they were only planning to abduct him, as the Turks allege. Supposedly, there are even recordings of the killing. But in the meanwhile, the attitude from the Saudi side has been defiance. Conservatives are divided on Saudi Arabia for good reason, and that has implications for the future grand strategy of the United States. Khashoggi is no liberal saint, not that it justifies his murder. Khashoggi wrote a glowing op-ed recently claiming the Muslim Brotherhood is not what the West thinks it is. It is the reason he was a dissident threat to the new Saudi prince, in a country that still runs according to rules of tribal loyalties. The barbarism of killing someone after luring him into an embassy is barely imaginable. But it is perfectly in line with what Saudi Arabia is and stands for. Saudi savagery in Yemen is fed and supported by Anglo-American diplomacy and weapons, which has been a cause of moral concern for even diehard Saudi backers. Saudi-funded Islamists in Syria are, on the other hand, responsible for the rise of al Nusrah, and balancing Iranian Shia militias and proxies. The two distinct strategic arguments on Saudi Arabia in American strategic thought, therefore, go like this. Is Saudi Arabia important to American grand strategy? How much should be tolerated, and at what cost to the Americans? Matthew Continetti suggests in National Review the Saudis remain important: “Saudi Arabia has been the linchpin of America’s Middle East strategy for close to a century. That relationship has not been without costs.” He argues a Saudi Arabia left alone would be an unstable monarchy, which would imperil it from Iranian proxies. Put simply, they are horrific, but they are better than chaos, and what comes after, if the House of Saud falls. Likewise, Walter Russell Mead argues that Washington's fundamental aim is to keep the Gulf oil free. That has been a strategy since the 1940s, and that should continue, and to ditch Riyadh would mean Iranian influence growing in the Strait of Hormuz. Long story short, regardless of how reckless Saudis are, it’s better them than letting Iran be a sole hegemon in the region. The Israeli balancing against Iran supports that thesis. Research suggests that Saudi Arabia and Israel have gotten closer in curbing Iranian influence in the Middle East. Recently, Israeli generals also met their Saudi counterparts. Mike Doran summed it up on Anderson Cooper’s show this week. Saudis are needed to contain Iran. Therefore, America shouldn’t act on a fit of righteousness. The counter-argument is that Saudi Arabia is irrelevant to the broader American grand strategy. As research suggests, petrostates rarely make good allies, and the Saudis are no exception to this rule. Petrostates are semi-feudal in nature. As Emma Ashford points out, due to their mono-industrial base, petrostates rarely have strong institutions. Their regional interests remain primarily sectarian and economic. Saudi rivalry with Iran fits this pattern. Iran, a modern and relatively secular country ruled by medieval Shiite Ayatollahs, has a centuries-old history of regional hegemony. It is the natural counterbalance to the Sunni kingdom. After the boneheaded American toppling of Saddam Hussein, Iran’s attempt to build a land bridge and expand its influence has fanned conflicts across the Middle East from Tehran to Tartus. However, as is the rule in geopolitics, that has led in turn to a spiral. The Saudis, feeling threatened, have supported Islamists to fill the vacuum left by revolutions, which in turn led to ISIS and further Anglo-American involvement. Fortunately, therefore, the Middle East isn’t as important to the Americans as it was before. Realism dictates that Washington should fall back to a strategy of Offshore Balancing, which would entail letting the local warmongers duke it out and entering the fray only to balance a potential hegemon if and when they arise. Iran, by that logic, is nowhere near hegemony, but the costs of trying for it are starting to rise, with the Russians risking a second Afghanistan by supporting their mousy client in Damascus. Rosemary Kelanic’s research indicates that energy-sufficient Americans don’t need Saudi oil either. In fact, the Saudis need American diplomatic and military backing far more in their Carthaginian endeavor to balance Iran. I fall right in the middle of those two arguments. As a realist, I instinctively dislike any further engagement in the Middle East. It is not geo-strategically important, it is declining with regards to U.S. resource needs, and America should focus more on Asia and Eastern Europe than on the Middle East. What could be the reason for further engagement in the Middle East? Clearly not idealism. No one, other than perhaps Max Boot, has a romantic notion of spreading democracy in that cancerous region any longer. Those dreams met a dusty and violent death on Iraqi and Libyan roadsides. To claim that our side supports a liberal rule-based order, and that we need to stand up to China and Russia while we gloss over Saudi perfidy, is an embarrassment to the notion that we are, at the end of the day, the good side. As a conservative, I believe order, even a fractured order, is more important than chaos and radicalism. The breakdown or collapse of the Saudi monarchy would engulf the region in a more severe long-term repercussion, much bigger and brutal than the one after the fall of the shah, the effects of which we are still experiencing. That being said, one cannot imagine the outrage, sanctions, or even calls for an intervention and regime change if the Venezuelans or Iranians dared to do what the Saudis just did. To hitch the ride to the Arab horse shouldn’t mean that the Saudis shouldn’t get a rap on the knuckles. After all, Saudis need the Americans a lot more than the other way around. It would be prudent to remind them of that reality.